Two competing factors has made assessing the impact of the Japanese earthquake on the Australian economy and the Australian dollar difficult. First, Japanese investors hold approximately $60 billion in Australian assets and own an additional $15 billion worth of Australian Uridashi bonds, which are denominated in Australian dollars but sold directly to Japanese investors. The recent sell-off in the Australian dollar against the U.S. dollar and Japanese Yen shows investors liquidating some of those holdings and this could continue as the Japanese repatriate to help in the rebuilding efforts. There is a lot of Japanese money sitting outside of Japan and when a crisis like this hits, the natural inclination of many of those investors is to bring money home. This process has driven the AUD/USD down 2 percent AUD/JPY down 3 percent. More de-leveraging and risk aversion means more weakness for the Australian dollar. However at the same time, the rise in commodity prices is positive for Australia because it makes their exports more valuable. Japan is Australia’s second largest trading partner. Approximately 18 percent of total Australian exports are destined for Japan, 60 percent of which are mining commodities. Rebuilding efforts by Japan will increase their demand for Australian commodities and resources, which is positive for the AUD in the medium term but in the short term, risk aversion could overshadow this demand. 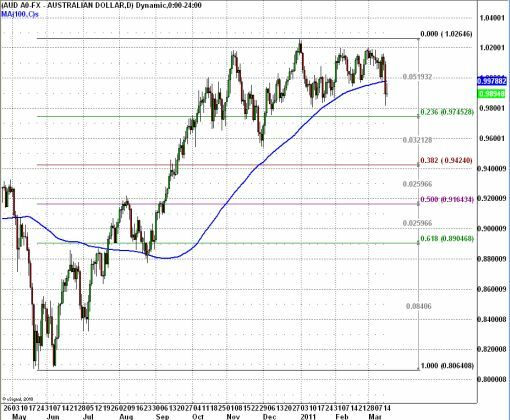 Technically, the AUD/USD has broken below 0.9980, which was a relatively significant support level in the AUD/USD. The next level of support is at 0.9745. Further losses are likely but if the AUD/USD finds a bottom, it could be a good opportunity to buy at value that because at the end of the day, increased demand from Japan will be positive for the Australian dollar and Australian economy.